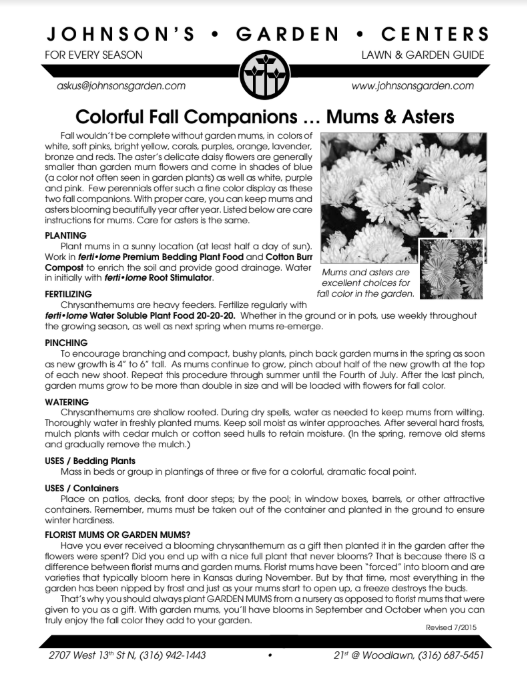 Fall wouldn’t be complete without garden mums, in colors of white, soft pinks, bright yellow, corals, purples, orange, lavender, bronze and reds. The aster’s delicate daisy flowers are generally smaller than garden mum flowers and come in shades of blue (a color not often seen in garden plants) as well as white, purple and pink. Few perennials offer such a fine color display as these two fall companions. With proper care, you can keep mums and asters blooming beautifully year after year. Listed below are care instructions for mums. Care for asters is the same. Plant mums in a sunny location (at least half a day of sun). Work in ferti•lome Premium Bedding Plant Food and Cotton Burr Compost to enrich the soil and provide good drainage. Water in initially with ferti•lome Root Stimulator. Chrysanthemums are heavy feeders. Fertilize regularly with ferti•lome Water Soluble Plant Food 20-20-20. Whether in the ground or in pots, use weekly throughout the growing season, as well as next spring when mums re- emerge. To encourage branching and compact, bushy plants, pinch back garden mums in the spring as soon as new growth is 4” to 6” tall. As mums continue to grow, pinch about half of the new growth at the top of each new shoot. Repeat this procedure through summer until the Fourth of July. After the last pinch, garden mums grow to be more than double in size and will be loaded with flowers for fall color. Bedding Plants: Mass in beds or group in plantings of three or five for a colorful, dramatic focal point. Containers: Place on patios, decks, front door steps; by the pool; in window boxes, barrels, or other attractive containers. Remember, mums must be taken out of the container and planted in the ground to ensure winter hardiness. FLORIST MUMS OR GARDEN MUMS? Have you ever received a blooming chrysanthemum as a gift then planted it in the garden after the flowers were spent? Did you end up with a nice full plant that never blooms? That is because there IS a difference between florist mums and garden mums. Florist mums have been “forced” into bloom and are var ieties that typically bloom here in Kansas during November. But by that time, most everything in the garden has been nipped by frost and just as your mums start to open up, a freeze destroys the buds. That’s why you should always plant GARDEN MUMS from a nursery as opposed to florist mums that were given to you as a gift. With garden mums, you’ll have blooms in September and October when you can truly enjoy the fall color they add to your garden.